Borrowdale, often referred to as Cumberland Borrowdale to distinguish it from Borrowdale in the county of Westmorland, lies in the central Lake District. The River Derwent flows through the dale into the lake of Derwent Water. Derwent Water is situated at the northern end of the valley and the dramatic Honister Pass leads away from the southern end. Borrowdale is also completely within the Lake District National Park and houses the villages of Grange, Rosthwaite, Seathwaite, Seatoller, Stonethwaite and Watendlath. Above Grange Bridge, Borrowdale is constricted between the steep slopes of King’s How on Grange Fell and Castle Crag below High Spy. This narrow gorge, known as the Jaws of Borrowdale, was carved by the last Ice Age and erosion over thousands of years. Borrowdale is one of the most beautiful places in Cumbria with sheep grazed uplands and extensive areas of oak woodland draping the hillsides. The valley pastures are divided into fields by massive stone walls and ancient packhorse tracks wind their way through the landscape along with the River Derwent and its tributaries. In the 16th century an enormous deposit of graphite was discovered near the hamlet of Seathwaite. Known locally as ‘wadd’ or ‘black lead’ the locals found it was very useful for marking sheep. This deposit of graphite was extremely pure and solid and it could easily be sawed into sticks hence the pencil industry was born in Keswick. Seatoller, a cluster of white and grey cottages at the foot of Honister Pass, once housed miners from the graphite mine and quarrymen from Honister Slate Mine. Slate quarrying developed in the early 18th century and a narrow band of Lakeland Green Slate running through Borrowdale and up to Honister became the primary building material for Victorian Keswick. Honister Slate Mine, reopened in 1996, continues to mine slate commercially and offers underground tours to visitors. The mine also offers a Via Ferrata tour which the Victorian miners used to use. The valley is a very popular tourist location, with hotels, guesthouses, holiday cottages, bed and breakfasts, youth hostels and campsites catering for the lowland visitor as well as the hill walker. The National Trust cares for and undertakes a great amount of conservation and access work in this very special and beautiful area. Grange often called Grange in Borrowdale is situated just south of Derwent Water in the narrow section of Borrowdale. The village, overlooked by Grange Fell and Castle Crag, dates back to medieval times when the monks of Furness Abbey built a monastic grange on the site. The double arched bridge over the River Derwent was built in 1675 and the Holy Trinity Church in 1861. Just on the edge of Grange set in this tranquil and stunning area of the Borrowdale valley is Borrowdale Gates Hotel which is a luxury 4 star country house hotel set in two acres of peaceful, wooded grounds. High Spy at 653 metres (2142 feet) is the highest point on the ridge that runs from Cat Bells to the start of Dale Head. The ridge separates Borrowdale from the Newlands Valley and the top of this part of the ridge is broad and fairly level but the flanks are steep especially those which fall in broken crags to the head of the Newlands Valley. Eel Crags that fall vertically on the Newlands side are popular with rock climbers. The summit has an impressive cairn and High Spy North Top stands nearly three quarters of a mile away at a height of 634 metres (2080 feet) the views are spectacular. In between the two tops lies an unnamed tarn. 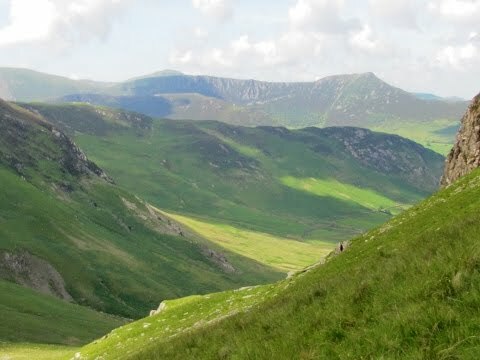 Although High Spy can be ascended directly from both valleys it is often climbed as part of the Newlands Horseshoe ridge walk. From the 17th century there was a huge expansion of stone and slate extraction which led to the rebuilding in stone of cottages and farmhouses in the Borrowdale valley. This altered the landscape and provided a livelihood for the valley’s inhabitants well into the 20th century. The remains of the disused slate Rigg Head Quarries along Tongue Gill are still clearly visible as a reminder of past quarrying in the valley although it appears to have been mined underground more than quarried. The building on the left is named as a climbing hut but is privately owned and not the property of any established club. The Honister slate mine located at the head of Honister Pass, a little further down the valley, is England’s last working slate mine and England’s first Via Ferrata. It is owned by a local family and produces the world famous Westmorland Green Slate. From Borrowdale Gates Hotel we take the public footpath opposite going through a gate. We bear left uphill and follow the path which bears round to the right and go through a gate. We turn immediate left and follow the track (Cumbria Way) to go through a gate and past through Hollows Farm. We head down the farm track for a short way and take the stone track on the right. We follow this track past the camp site until we reach the River Derwent then turn immediate right and cross over the footbridge. We follow the track past an old quarry and when we come to a footbridge we head straight forwards through the gate. We keep following the track uphill passing Castle Crag on our left and when we get to the brow we keep heading forwards on the track until the track splits we take the higher path to the right uphill we can see a bridge over Tongue Gill on the lower path down below. The track bears right and we go through a gate and cross over Tongue Gill via the rocks. We keep heading forwards, with the gill on our right, uphill through the old disused quarries until we reach a large boulder at the top. We bear left at the cairn following the path to the next cairn and head forwards to go over the stile. We keep heading straight forwards on the very faint path towards Dale Head. When we reach a very small tarn and a path we turn right and follow the path steeply uphill. The path becomes rocky and then grassy and we follow the large cairns to the summit of High Spy which is marked by a tall stone and slate stacked cairn. We keep heading forwards following the cairns and after passing a small pond on our right we drop down hill slightly into a dip. We turn right here at the cairn and follow the small cairns downhill. The path is very faint but just keep heading straight forwards downhill towards the valley below. After crossing over a small stream we start to bear left. Before two large rocks look out for a small cairn on the left which could be quite easily missed. At the cairn we head steeply downhill following the path below the crag on the left towards the trees at the bottom of the valley. We eventually go through a gate and follow the path slightly uphill and then downhill to the gate and the road where we started at Borrowdale Gates Hotel. This is a hard walk on grassy paths and stony tracks with some steep inclines and declines. Approx 5.2 miles allow 3 – 4 hours using OS Explorer Map OL4, The English Lakes North – Western area. Grange in Borrowdale in the Lake District, Cumbria. From the A66 coming from the east take the A5271 for Keswick. At the junction turn right. At the traffic lights carry on forward. At the mini roundabout turn left then left again at the junction. At the roundabout go straight over then at the next roundabout turn right and follow this road passing Derwent Water. Take the right turn over the bridge to Grange. Continue through the village to Borrowdale Gates Hotel. There are various parking places at the side of the road. There are no public toilets or refreshments. The nearest public toilets, the Royal Oak pub and the Flock-in Tearoom at Yew Tree Farm are at Rosthwaite. There are many more facilities in Keswick.